Imágenes de RPC-135 durante su estado activo. Protocolos de Contención: RPC-135 está contenido dentro de una cámara de contención estándar. Esta cámara de contención debe asegurarse con una puerta de cierre hermético doble sellada magnéticamente. Se requiere que dos personas de seguridad se mantengan dentro del alcance pero fuera de los efectos de RPC-135 para garantizar que los sujetos de prueba ingresen sin que RPC-135 se materialice nuevamente fuera de la cámara de contención. Todos los sujetos de prueba expuestos a RPC-135 deben retirarse de la cámara de contención antes de realizar pruebas adicionales. Se requieren evaluaciones psicológicas y tratamientos psiquiátricos obligatorios para cualquier sujeto de prueba que trabaje con RPC-135. Descripción: RPC-135 es una estatua de hierro vestida. El objeto mide aproximadamente 1,8 metros y pesa 500 libras, y lleva una TV CRT entre las clavículas. La anomalía transmite constantemente una secuencia rápida de imágenes cosmológicas aleatorias que representan un patrón. La fuente de la emisión no se puede rastrear. Cualquiera que sea este patrón, la anomalía recibe estas señales que, a su vez, desencadenan una respuesta emocional dentro de quienes lo ven. RPC-135 will always remain motionless even upon activation when in the presence of humans. If there is no indication of a human present in in visual range, RPC-135 will instantaneously re-materialize near the nearest living human if there are no obstructions between it and the anomaly's target. How this is possible is unclear. Research is ongoing. 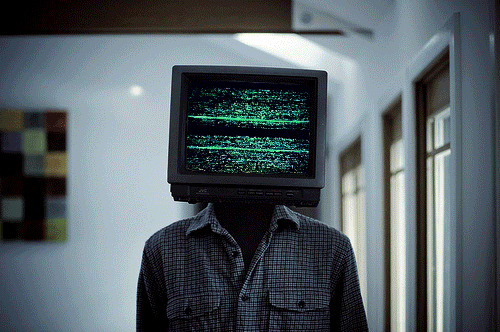 Upon making visual contact with the anomaly, test subjects will become entranced and stare into the anomaly's CRT screen for approximately thirty minutes. In most cases, the subject will approach RPC-135 and attempt to make physical contact. RPC-135's screen will then turn to static as the test subject climbs into the screen and vanishes from reality. How this occurs (as the screen is too small for an adult human to fit through the aperture) is unknown. Indirect observation of RPC-135 does not trigger its anomalous effects. On several occasions, test subjects have entered RPC-135's containment chamber equipped with retrieval harnesses and shoulder-mounted cameras. Unfortunately, no visual records exist of what lies on the other side of RPC-135's CRT screen, as the tethers attached to the test subjects' retrieval harnesses were severed upon passing through the aperture. Dr. Apth: D-3315, can you hear me? Yes. I can. I am here. Dr. Apth: You and several other D-Class personnel openly express desires to return to RPC-135 during your debriefing. I would like to know if there was anything of significant importance that you can tell me. What do you mean by going back 'there'? What I mean. I want to go back there. Dr. Apth: What is 'there' exactly? RPC-135? Dr Apth: Do you mean the series of cosmological imagery it was showing? D-3315: No. Signals. Call for us. Sing for us. Color for us. It can bring us there. Dr. Apth: That does not explain what can be found 'there'. I really liked what I saw. Its so much better than… than what I have here. I look… and… I see… I see myself… A chance to start over… I could take up the chance to make something for myself somewhere beyond. This world has not given me a path to follow and I'm nothing more than a bum on the side of the road before you picked me up. Even then, I felt like I had nothing. But… it showed me something more. I felt like I was complete. The signals, the stars… you know I always dreamed of traveling the stars… Now they were signaling me to come, and showed me that I could reach them through… what do you call it? 135? I could reach it through that TV head. There's nothing else for me here to be honest and I don't think helping you guys is going to make me get back the years that I lost. I hope I can go there soon. Closing Statement: No discernible information could be attained from the subject at this time. D-3315 was placed under supervised care for any further developments.